The Tusket River of southwestern Nova Scotia has been of particular interest to botanists since the early 1920's when pre-eminent botanist M.L. Fernald found several plant species not previously noted, and completely unexpected in Nova Scotia. These findings have led to a larger discovery of disjunct populations of Atlantic Coastal Plain Flora in the province. To preserve this unique feature of the province, a 22 hectare protected area was established along the Tusket River, in an area that provides ideal habitat for the establishment and persistence of many coastal plain elements including 6 rare taxa, and the largest populations of Coreopsis and Sabatia along the river. 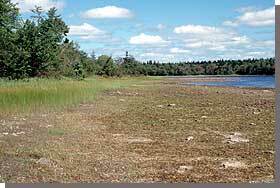 A small woodland buffer protects the rich shoreline-beach plant community. Research and education are undertaken at this important site. Unfortunately, cottage development, nutrient loading of lakes and indiscriminate all terrain vehicle use on beaches and along lake margins threaten to degrade the status of these rare species.